Due to his double statute of director and film producer, Alfred Hitchcock (13 August 1899 – 29 April 1980) impresses posterity with fierce labour and remarkable talent transposed into over 50 films directed. He was born in London, where he carried out his astonishing cinematographic activity for a long time, and then he developed his directing skills in 1939, in the United States of America. He became accustomed to the field of cinematography when he was part of the Famous Players-Lasky Corporation, being in charge of creating subtitles for silent movies. This experience infused various feelings inside of him, which determined him to make a first attempt to produce the film Number thirteen, which he has however never finished. Once he stepped on the American soil, the well-known director Hitchcock became successful for the film Rebecca (1940), a great adaptation of Daphne du Maurier’s novel, and a melodrama which won 11 Oscar nominations. Unlike many other directors, he awakes the interest of the movie fans with the intention of seducing, controlling and surprising them, transforming himself into a master of suspense. But despite these views on his work, it should be noted that his directing activity equally fosters a form of intellectuality, a vision which he offers us in Rope (1948), a film that exploits a series of reflections on evil, under the auspices of Nietzsche’s philosophy. 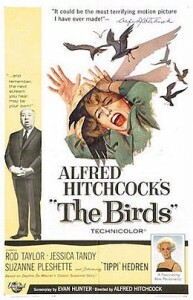 However, the little success it provided him determined Alfred Hitchcock to reintegrate his creative vision in the conventional category of thrillers. In 1958 he received the Golden Globe for the best series, and the ´50 – ´60s represent a prolific moment of his creation, which translate into real masterpieces, such as: Strangers on a train (1951), Dial M for Murder (1954), Rear Window (1954), North by Northwest (1959), Psycho (1960) and The Birds (1963). A major contribution to his enormous success also consisted in exemplary choosing the actors: James Stewart, Cary Grant, Grace Kelly, who gave a monumental atmosphere to his films. Moreover, the amplification of the performance is due to the composer Bernard , who created the soundtrack to Hitchcock’s films since 1957. It was a collaboration which can determine nothing but a perfect compositional harmony, in keeping with the ambiances for which the director strives.